Missile Defense Intercept Test at Korla? Over the weekend many residents in Xinjiang Province posted pictures on Chinese social media sites of a mysterious event in the sky. Rather quickly online commentators began to speculate that this event was a missile defense test from the Korla Missile Test Complex. Over the past year Jeffrey and I have discussed this facility here and here, so a possible test (with pictures no less!) naturally piqued my interest. The general location of the images taken and the nature of the contrails indicate this event was likely an intercept test, probably of the SC-19 hit-to-kill vehicle associated with the KTMC. 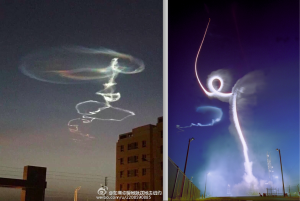 Comparing the corkscrew contrail pattern found in the images to a past U.S. Terminal High Altitude Defense (THAAD) intercept test may suggest an energy management steering maneuver of the vehicle to test operators’ ability to reduce the missile’s speed. Left image is from this weekend (via Weibo). Right image is from a THAAD flight-test on June 10, 1999 (Lockheed Martin)..
Additional images of the likely test can be found here, here, and here. While the HTK test vehicle would be launched from Korla, the target missile would likely come from the Jiuquan Satellite Launch Center. The geographical descriptions of where various images were taken appear to support the conclusion that the intercept occurred to the east of the KMTC but to the west of Jiuquan. 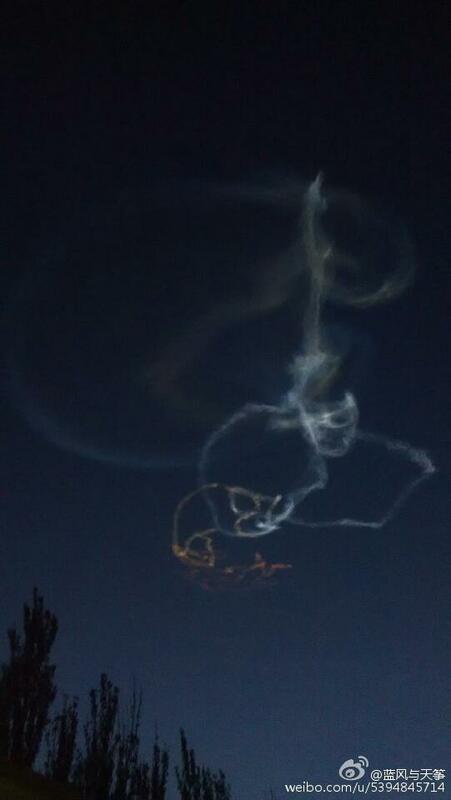 As far as I can tell the Chinese military has not yet publicly confirmed the test. I am going to try the geo-locate the contrail from the images. In the meantime, as always I am interested to hear any thoughts from interested readers. You probably were in a bit of hurry to confuse in right and left images in their origins. If the contrail was really the so called energy management steering maneuver, then Chinese missiles have achieved a great steering capability to form an almost perfect square in the contrail. Geolocating a contrail would be difficult I guess as it is not located on the geo. Thanks, Raj. Yes I was in a bit of a hurry and confused the left and right images but have now fixed. Thanks for pointing that out, Gregory! Corkscrew is nominal due to rotation of stratospheric winds with altitude (atmospheric gravity waves, AGWs). The THAAD energy management turn is tropospheric and distinct from AGW corkscrew. Google (rocket of choice) launch and you will see the “crazed” pattern due to AGW in all cases. Don’t know about your expectation of AGWs, I see the normal layering of high altitude winds and projection / lighting artifacts associated with particle sizes and scattering geometry. Don’t try to read too much into single images, real analysis requires at least 2 well calibrated imagers with matched timetagging. Gertz appears to be a willing dupe of marketing and that sort of speculation unsupported by engineering analysis is the worst sort of panic mongering. Well, yes, that’s what Gertz has been doing for the past two or three decades. On occasion, particularly during the 1990s when he was at the Washington Times, he’s served as a useful conduit for TS/SCI leaks from right-wing sources in the Pentagon. These days not so much.